The aerial and supporting roots of lofty fig are quite special. They can not only entangle the plants they parasitizes on, they can also form a forest of one tree. In the garden of figs, the researchers can make them form the scene of a one-tree forest through artificial inductions. The researchers will cut some openings in their large branches, smear the openings with rootage liquids, and wrap them with nutritious earth; then young aerial roots come out, the researchers would connect them to the ground with long bamboo barrels filled with humous earth; in this way, the aerial roots will grow very quickly, and will insert into the earth to become supporting roots gradually. Lofty fig can also be the parasitized plant of many epiphytes, parasites and climbing plants, such as orchids, ferneries and mosses. During the blossom season, people could see many different kinds of flowers growing in one tree, thus form a spectacular landscape of "a garden in the air". Though the fruits of lofty fig are very small, they can produce in large amounts. When the fruits are ripen, we can see many red fruits like gems are growing on the trees. They may attract many birds to find food and thus makes the garden a busy scene. At this time, lofty fig is like the paradise of birds; so it is no strange when we hear the local Dai folks say it has a soul. In Xishuangbanna, may local folks believe lofty fig is a holy tree and worship such trees very much. In the Dai families in Dehong of Yunnan, whenever a family gives birth to a new baby, they would plant a lofty fig nearby the village to ask for the sheltering of Gods. 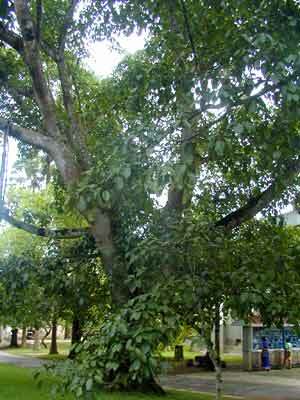 Lofty fig is 25-30 meters in height when grow up, and the chest diameter can be as thick as 1.8 meters; the canopy of the tree is very beautiful and it is a famous tree for forestation of the yard. It mainly scatters in Canton, Guangxi, South Yunnan, Vietnam, Malaysia, and India etc. and they mainly grow in shaws in mountain areas.